North-Eastern states, namely, Assam, Arunachal Pradesh, Manipur, Meghalaya, Mizoram, Nagaland and Tripura did not feature in the expansion plans of many big retailers till some time ago. Due to lack of information or vague idea, retailers were hesitant and uncertain to make inroads into the regions. Over the years, the scenario has changed; many shopping malls and large format retail outlets have come up in the region. Guwahati, a major city in Assam has a large number of shopping malls such as Sohum Shoppe, HUB, Dona Planet and The Cube, vis-à-vis other eastern states. Vishal Megamart opened its first store in Guwahati at Amaze Shopping Plaza. Titan Industries also has its retail presence with watch showrooms in Guwahati, Dimapur, Nagaland, Tripura and Agartala and Tanishq jewellery stores in Guwahati and Agartala. Future Group too made its presence felt in Guwahati, Darjeeling and Siliguri with both Big Bazaar and Pantaloons outlets. It opened its first 75000 sq. ft Big Bazaar outlet in April 2007 and 30000 sq. ft Pantaloons outlet in the same year in Guwahati. Another 24000 sq. ft Big Bazaar outlet came in January 2009. “Once we got a suitable location in Guwahati in 2006, we decided to launch two major formats of future group Big Bazaar and Pantaloons, when Tinsukia opportunity came we opened Big Bazaar with an approximate investment of Rs 2000 per sq. ft,” said Manish Agarwal, Chief Operations-East, Future Value Retail. The Levi's Brand, currently has seven outlets in the region, four in Guwahati, Gangtok and one each in Kohima, Mizoram and Gangtok. 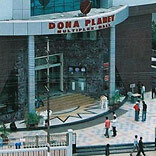 The total retail space of these outlets is approximately 15000 sq ft. Seeing the future prospects, big players in the retail sector are looking to consolidate their retail business in the region. The low rental values and price, and large availability of commercial space as compared to the metros have attracted many retailers. Man Mohan Bagree, VC of South City Mall (Kolkata) says that the current rental values for malls in Guwahati is within the range of Rs 120-135 per sq ft, per month. When it comes to fashion, north easterners are not behind youth in metros, they are aware of most of the international brands. The spending and purchasing power is also not low, which provides retailers an opportunity to expand their footprints in the region. “A large population of fashion and brand conscious youth is looking to get into the latest in jeanswear fashion. So, consumer response has been extremely promising, prompting us to double our store count in the region over the last one year,” says Shyam Sukhramani, Marketing Director of Levi Strauss (India) Pvt. Ltd. In the past eight months, new malls have been thrown open to the people of Guwahati, creating tremendous opportunity for retailers. Levi Strauss Signature has aggressive plans to expand further in the North-East market. The company has chalked out to open at least 14 new stand-alone Levi Strauss Signature stores within this year. Overwhelmed by the response from the customers, Future Group is coming up with Big Bazaar in Jorhat, occupying a space of 300000 sq. ft, in a year, and at Silchar with 24000 sq. ft of space in 6 months time and intends to expand further in Guwahati with an investments approximately of Rs 2000 per sq. ft. It is also opening in Gangtok in next 2-3 months.